Are you looking for a Ferrari F1 Team or McKlein calendar to hang on your wall? Or a Red Bull Racing F1 Team calendar? Our shop offers Formula 1 calendars of great quality and at affordable prices. Count the days with the Motorsport calendar. 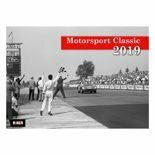 2019 McKlein Rally Calendar - "Motorsport Classic"
McKlein Rally Calendar 2017 - "Rally History"